Essen, Germany (May 3, 2018) – The Lichtburg, a historic cinema in the center of Essen, houses Germany’s largest cinema hall with 1,250 seats. 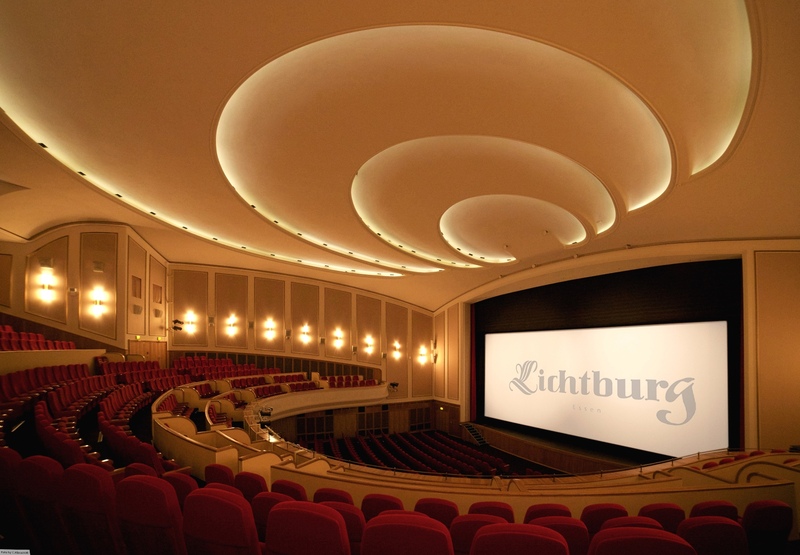 During the 50s and 60s the Lichtburg was one of the most important premiere cinemas of the Federal Republic. And even today, creative people and distributors are once again using the unique historic ambience of the cinema for their glamorous premieres. The demands on such a premiere cinema are high. The projection technology of the hall was already up to date. In January 2018, finally, the public address system was also renewed. “With the renovation of the cinema sound system we want to live up to the increased expectations of our visitors,” says Marianne Menze, managing director of the Essen Filmkunsttheater GmbH and since 1998 operator of the Lichtburg. Since the landmarked architecture of Lichtburg clearly deviates from a standard cinema, a special solution was needed. A pro-ribbon Cinemarray CRA30 of Dutch sound system manufacturer Alcons Audio was installed, which optimally covers the very large hall with its curved balcony. The Cinemarray CRA30 is a 3-way sound system designed for digital applications in large premium cinemas that demand the highest quality with perfect sound reproduction and coverage. Featuring three patented RBN401 pro-ribbon drivers, Alcons’ CRA30 combines a remarkable clarity with an “uncompressed” linear response at every sound pressure level. The patented horizontal dispersion extends the stereo image to a larger number of seats in the hall. Through the use of line-source technology throughout the system, a flat SPL coverage from front to back is realized. The precise projection also minimizes unwanted acoustic reflections. The line-array technology also ensures an impressive throw on and under the balcony and offers a significant performance improvement compared to the previous speaker system. Behind the 150-square-meter roll-up screen are three arrays consisting of 2 x Alcons CRA30N (narrow) and 1 x CRA30W (wide). Two Alcons CB362 (2 x 18 ” bass) placed on the ground are responsible for the LFE-channel. All systems are driven and controlled by a total of five Alcons Sentinel10 amplified loudspeaker controllers, each CRA30 module is operated with two amplifier channels. Since the large screen of the Lichtburg can be rolled up, the cinema hall can also be used for theater performances, cabaret, concerts and presentations. Here, too, the Alcons pro-ribbon Cinemarray™ system fully exploits its strengths. “Of course we were also happy to install a system that is also perfectly suitable for stage events and thus eliminating the absolute necessity to hire equipment, ” adds Menze. More information on : www.lichtburg-essen.de , www.cinemarray.com and www.alconsaudio.com .